Add fries, salad, soup for $1. Served with hummus and garlic sauce. Served with Rice, Salad, Pita, Hummus and Garlic Sauce. Originally created in 2012, Fresco Sauce’s Fire Roasted Pepper blend was meant to be served alongside dishes at Sam Dashti’s new restaurant, Rosemary Grill. It was an instant hit and customers wanted to take it home. 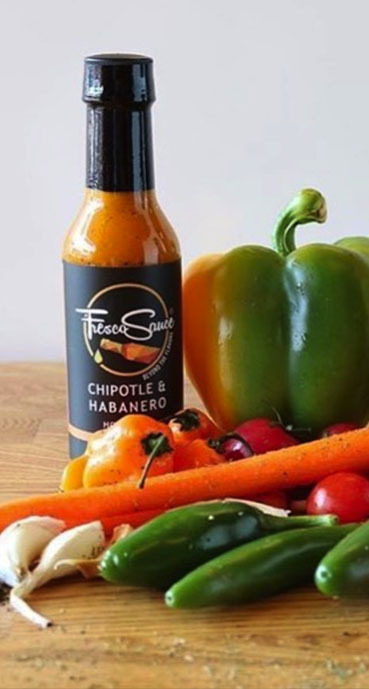 Exclusively sold in the restaurant for five years, the blend was finally bottled for the general public in 2018 along with the latest additions to the Fresco Sauce line, Chipolte & Habanero, and Ghost Berry. Today, Sam uses the same care to create the Fresco Sauce line he used in 2012, starting with fresh ingredients and cooking by hand in small batches.